I've been buying the ready-made "kaya" (coconut jam) all the while for bread and my bao's filling. My grandma used to cook her own kaya. When I was small, I use to ate the kaya she cook for us. Her kaya are smooth and taste heavenly yummy. I got to know from my mom that, she use duck eggs for her kaya and added caramel in it. But, unfortunately... I didn't learn from her and I don't have her kaya recipe. My mom told me, my grandma don't have any particular recipe for her kaya. She'll measure all her ingredients with her cups, bowls or by hand, she just got her own recipe ~ lol.. 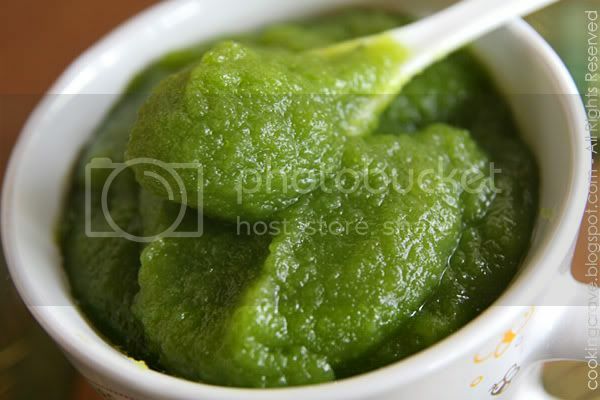 Here is the recipe for Pandan Kaya. Blend pandan (screwpine) leaves with 100ml of the coconut milk in a blender. Strain to discard pulp. In a mixing bowl, lightly beat all the eggs. Add sugar into beaten eggs. Use a hand whisk to stir mixture until all sugar dissolves (Note 1). Add coconut milk and pandan juice in (1) into egg mixture. Stir well. Pour kaya mixture through a sieve (Note 2) into another mixing bowl (stainless steel preferred). Bring a pot of water to boil. Reduce fire and place mixing bowl over pot of barely simmering water(Note 3). The fire should be really slow (Note 4). Stir kaya occasionally for the first 25 minutes. When kaya starts to thicken, stir it continuously. When kaya reaches the desired thickness, takes at least another 1 hour, remove it from heat. Cool completely (Note 5) before storing it in a clean jar. Keep refrigerated. Spread over bread, plain crackers, serimuka etc. 1. It takes longer to dissolve granulated sugar than castor sugar. Make sure all the sugar dissolves before adding coconut milk. 2. The purpose of pouring kaya mixture through a sieve is to eliminate big air bubbles, formed during the whisking process. Existence of air bubbles will result in non-consistent or lumpy kaya. 3. I suggested double boiler heating method as this method would give a considerably slow heating effect to the kaya mixture. However, if your stove does come with a slow fire function, use direct method. The whole cooking time will be reduced. 4. With the real slow fire I was using, it took about 25 minutes before kaya mixture started to thicken. After this stage, stir mixture continuously as it gets thicken faster. 5. Kaya will turn thicker when it is cool. I will rather it taste good than it looks good. Post recipe soon, I hope it will inspire my wife to make this too, ha! I use my breadmaker to made kaya...lazy to stand and stir. 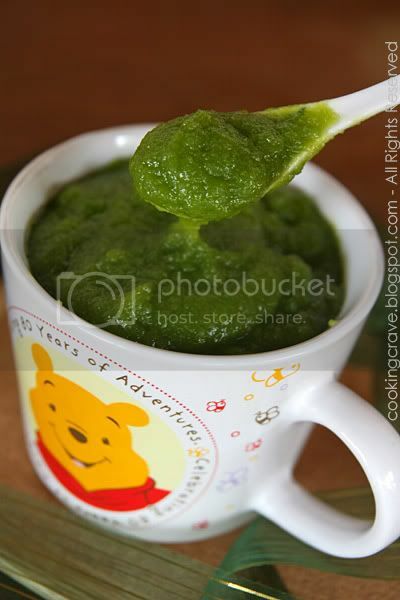 thanks for the receipe..I always wanted to cook pandan kaya,but couldn'get the receipe..now I can try it out...hehe.. I love the rich colour! This is my hubby's favourite. He's been hinting since forever for me to make it. Haha, maybe I'll surprise him soon...! Hi not to worry about the grainy kaya. All you have to do is use your blender to blend it. It will be very smooth! :) For your info, this kaya is not suitable to use as filling as it is very runny. You need firm kaya for buns. Hey my dad did one recently but his version is orange in colour and has salted eggs in it.... tastes great. Will try your version soon , looks very sweet !!! I have sweet tooth and so are my kids. Thanks for the great recipe. I successfully make it and my hubby love it!